Spectra of the most energetic hadrons in cores of extensive air showers (EAS) were obtained for the first time in the HADRON hybrid experiment in Tien Shan mountains. The spectra in question exhibit a scaling violation, which requires invoking nontrivial effects in order to explain this circumstance. In the present article, unusual data on pp-interaction cross sections from recent experiments at the Large Hadron Collider are analyzed with this aim in view. A comparison with data at lower energies shows that the elastic cross section for pp interaction grows faster than the respective inelastic cross section. 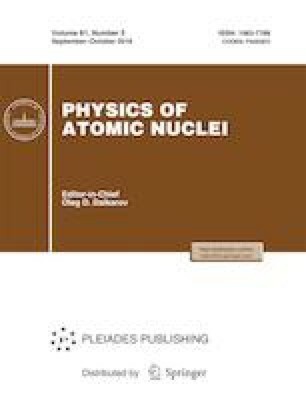 It would be natural to expect that a similar or a stronger effect is present in nucleus–nucleus interactions in cosmic rays. A possible change in the properties of nuclear cascades in the Earth’s atmosphere provides the possibility of discussing a new interpretation of the knee in the EAS spectrum and some exotic phenomena observed in cosmic-ray experiments. This interpretation is proposed for the first time. Particular attention is given to unique data from the HADRON hybrid experiment. Original Russian Text © S.B. Shaulov, 2018, published in Yadernaya Fizika, 2018, Vol. 81, No. 5, pp. 585–590.